After the base-coat is applied, the paint crew returns and begins filling in all of the blemishes on the walls surface with joint compound. 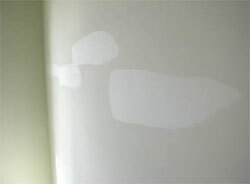 This process smoothes the walls out nicely and will make for an excellent, flat surface to paint on. Walls are definitely one of the things that are first noticed when people go inside of buildings and homes. Having your walls nicely painted and regularly maintained are ways to prove that you know how to take care of a home or an office. However, you cannot avoid problems with painted walls. Here are some ways to fix the different kinds of blemishes that can occur, including cracks in your painted walls. One of the things you do not want to see on your precious walls is tape adhesives. Removing it just by pulling it off may cause marks. You can look for a tape or adhesive solvent in a hardware store if you want to remove tape from a painted wall. The solvent is the solution if you do not want to remove the paint when you remove the sticky tape. However, you need to identify the kind of paint that was used for the wall. Avoid oil-based solvents (which are best for enamel paints) for flat latex paints. If you have already removed the tape without solvent, you may see some marks or glue residue. You can resort to detergent and warm water. Mix detergent with water to form a soapy solution. Get a piece of cloth and damp it with the solution. Wipe the adhesive marks with the wet cloth. You can also use a razor blade to scrape off the adhesive mark. Another option is to dampen a piece of cloth with denatured alcohol. Wipe the surface and see if the adhesive mark will be wiped off. With kids around, there is always the possibility of having your wall turned into an art pad. Luckily, there are ways to remove ink and even crayon marks from a painted wall. You will be surprised to know that repainting is not always the solution. Remember that ink is easiest to remove when fresh, so act as soon as you see the ink. You can use a cotton swab or a piece of cloth to apply rubbing alcohol or hairspray to the wall. They may be readily available in your home and are much easier to find than stain remover sticks that are available today. Do not apply the alcohol or hairspray directly to the paint so you will need to grab cotton balls or rags. You will need cool water in washing off the wall because the alcohol or hairspray will liquify the ink mark that may scatter on your wall. Cracks are more likely to occur in drywall. One of the causes is moisture that can result from changes in the temperature. Luckily, cracks that are as thin as a strand of hair are easy to fix and you can definitely do it yourself. You will need a small amount of premixed joint compound, a sander, a putty knife and a drywall-taping knife. You can also look for a joint compound and follow the manufacturer's instruction for mixing. The first step is to sand the part of the painted wall that have cracks. Use an eye protector and respirator mask. Take enough joint compound for filling in the cracks. Use the putty knife for smoothing the surface. Press the applied compound using the knife and use its blade to wipe and remove the excess. You will need to sand the surface once it dries completely. Repeat the steps to apply a second coat of joint compound. You need to make sure the joint compound dries completely before beginning the next step. The last step is sanding and then repainting. Your walls may get blemishes like ink stains and tape marks or even cracks due moisture or poor quality paint or painting. Fortunately, there are easy and practical solutions for these problems. You will not need to repaint when you find ink or tape marks on your wall. And, you will not need a professional to do crack-filling for you. Try one of the solutions above. If you take your time and have the right tools and materials, you will complete the improvement successfully!